This review is targeted in giving you a clear overview how this program can suit your needs if you own a Mac and like chess a lot. Given that all 12 million Macs out there already have a free chess program at their disposal, the audience for buying chess programs for the Mac might be slightly different than the audience for PC chess programs. I will try to answer the question whether or not Chessmaster is good enough in order to convince you in spending €40 for it. I will also try to compare Chessmaster with the other available programs for Mac. Last but not least, you will find plenty of links to other reviews of this piece of software. One side note, I did not pay for the program. If you pay for it, you might be stricter than I am. In order to compensate, I am a typical Mac user expecting only the best to be good enough. Yet, you might fall in the same category. I do also own a lot of other chess programs as you can read from the other pages at MacChess. Reviewing this is done in the light of the other available software available for Mac. Opening the package gives you a small manual and 2 disks. The first disk contains the application, the second disk contains a set demo versions of other applications that are edited by the same company. A nice bonus if the section following here does not please you. All of the fluently install on Mac OS X 10.3. Clearly visible is the fact that the chess program stems from a company making other 3D applications. You get a nice introduction video that shows people playing chess through history. You also get the sound and visual effects you regularly see with other games. Maybe misplaced for a chess program, but one does not argue taste. Next step you have to pass is the log on-dialog. You might wonder what log-on is all about. Well, you could create different personalities, or have your friends play with your account, and avoid that they are messing up your Elo points you have gathered. (I created different personalities according to the level of alcohol in my blood.) To say the least, it is one of the least obtrusive log on boxes I have ever seen. Could it be because of the minuscule chess puzzle on the screen? After a while, the puzzle becomes a little irritating but it is a nice idea, something others could learn from. Once passed this step, you are in. You will be amazed by the number of features it has. I have seen a lot of chess programs, yet one has to beat Chessmaster in the number of features. In order to find your way easily in all features, the program is oriented through a number of rooms. Please skip the rooms that are of less interest for you, I will give a brief explanation of all of them below. This room is about playing games. It is the main room where you will be when you are playing chess. The layout is configurable and different configurations can be saved. It contains default configurations for different screen sizes. This happens transparently as you use another screen-size. It also bears a mentor window that can advise you while playing. Everything is configurable in the game room. All chess cadences are not supported so it might be less appealing if you want to train on e.g. Interclub tournament clocks. You can select among different opponents while in the Game room. This is the room I used the most up till now. This room allows you to organize tournaments with a number of personalities, a number of weaker players, a number of random players and a number of human players. Different types of tournaments are supported. Swiss, round-robin, double round-robin... It is not possible to configure the parameters of the Swiss tournament though, ladder and elimination types are not supported either. It would be nice to see other types of tournaments to be supported. The feature of having the different personalities playing against each other is nice however. The same comment for game clocks does apply as for the game room. It is not possible to involve other chess engines in the tournaments other than by manually performing the moves. It would be nice to see the UCI or the XBoard protocol to be implemented. I also have to mention that I found it rather strange that the time usage of the program on the different levels seems badly distributed. In difficult situations, the time used to find a good move is not increased as can be noticed in most other chess programs as in human play. The program seems to become time stressed when under pressure. Different levels of classes are presented. Most of the classes are for beginners. There are some classes for higher ranked players but I doubt that the classes for advanced players will please you. I did not explore the classes in more depth. While funny when starting up, I cannot judge any deeper than this by definition. I am an adult and my judgment could be completely opposite to the judgment of children. I noticed that none of my children where particularly interested when they got a glimpse of the program. Given that Chessmaster is only available in French and in English, and that most children that have another mother-thong are probably not fluently enough at the age the kids room seems to address, I urge Chessmaster to implement more multi-linguasim in this room especially. I did not study this part in much detail, partly because the other alternatives on the Mac OS X platform already provide enough functionality. Only 800 games are included. Most of them are historic games. The library will let you explore the chess books. It does allow you to search for variations and to go through the tree of the moves. It is nicely done; still it is a bit off the implementation of Chessbase. Chessmaster does implement only part of what is implemented in the freeware SCID application. It does also search less than Chessbase. It is better and speedier than Jose on the same hardware. For Mac OS X there is nothing else that comes close to it. 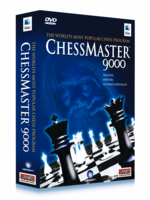 Given the large library of 500000 games given with Chessmaster, it is certainly an improvement for the platform. I did not spend much time in this room. The reason for this is that I am an avid user of freechess.org and gameknot.com that are both oriented towards the more professional chess players. This does not mean that the CM room is not professional. It just means that I did not find any reason to try this. When I tried, I could not find any online opponent. For online play, Fixation is much better. This could be of most interest. Yet given the relative strength of all available top programs, basing your decision on this category is slightly overrated. Given that you probably belong just as me in the lower 99% of the chess playing population, and that all good chess programs belong to the upper 1%, this means that you will either obtain 0 or 0,5 out of 10 against any of the strong chess programs. Most people must end up by artificially decreasing the strength of the program in order not to be beaten all the time. For analysis of your chess games, top programs remain a must and this program can act for most of you. During the first weeks I found that the chess level was less than the other top-rated programs. This feeling was probably caused by the difficulty Chessmaster has in using the time allotted correctly. This remains unconfirmed and it seems that the deviation is only slightly off the top-rated programs. Analysing some top games at 2 hours for 40 moves by other programs did not reveal any weaknesses. At the higher levels, the deviation is lower than at the faster levels (<30 minute games). This is a strong statement to make as I could not find any proof for the weaker play. I will try to post analysis of games where Chessmaster went wrong. I also have to mention that the only way to test this thoroughly is by playing plenty of games in between other chess engines, given the absence of interfaces to other programs, the manual process is a tedious one. To be updated. Note: The underlying engine is the engine The King version 3.23 written by Johan de Koning. If someone can point me to an UCI or preferably XBoard implementation on top of this engine, I can test the engine automated. If you are a casual chess player, but want to have a good chess program in your collection, this application is a must have. If you are a “wannabe” good player, the program is also for you. If you like to buy good software, this program is also a must-have. Crafty will prove a good enough partner, if not stronger. In that case you will be missing the nice user interface and the other features. You might want to balance your decision based on other reports as well. I already mentioned the lack of XBoard or UCI protocols. On the other hand, PGN and EPD are fully supported. PGN output is in the language of the installation however, and not in a selectable language. The application also lacks a tool to do conversions of PGN files from one language to another. As such it is impossible without a third-party tool to easily exploit PGN functionality. During my usage of the program, I came across a number of shortcomings. These are shortcomings I found important for me. They might be a lot less important for you however. None of the shortcomings are important enough to seriously influence the overall impression of the game. Note: There is a bug-fix available that addresses some of the issues listed. I did not update this report since, so you will have to see for yourself for the time being. Confusing install, no language selection on install. It would be nice to have the user confirm the language selected. Installation is only in French if the user language is French. If the user language is other than French, the installation is done in English. Even if the first language is defined as e.g. Dutch and the second language is French. (Major) Does not well control time usage in general. No correct time usage in analysis mode, no correct time usage in tournament play. Occasional crash while changing chess set during tournament play between different engines. When slow moving is selected, thematic sounds come at the wrong moment, not when piece is dropped but when it is taken. This is normal behaviour for the windows versions of Chessmaster but still no excuse for the Mac port. I miss a number of more standard chess sets and chess boards. Special ones are nice but compared to the choice of specials; the number of normal chess sets is a bit limited. I could not find the various typical ones you can find in other programs. Program preferences are stored in a very deep location. I would expect to see them stored in ~/Documents for saved games and in ~/Library for user preferences. Well, this is not the case. You will understand if you look up the location for yourselves. Sound stopped when not in foreground. Feral's website is very accurate on features of the program. You can use it safely as a reference. You can purchase online from the Apple store or from Feral Interactive. In Belgium you can find it also at Schaakhuis Marchand and Cami.